MSCRM has an oversight in the default Opportunity-Quote-Order process in taking fields entered at the Opportunity Product stage and having these mapped to any resulting Quote Product or Order Product records. This means that any fields (such as the field we added to the Opportunity Product screen to track the Product Number of the Product entered from main post in this category) are not mapped over to the resulting Quote Products on our Quote. This obviously would be confusing to the end-user! However whilst MSCRM does not directly list the relationship between a Quote Product and Opportunity Product within the available Customisation User Interface – this relationship (and crucially it’s Mappings) are available to us. The following steps allow us to add or remove mappings to this relationship, and ensure that our custom Product Number field is mapped across. STEP 1 – Run a SQL Query against the MSCRM Database (typically X_MSCRM where X is your Organisation Name for the MSCRM Deployment) to determine the GUID Id of the Relationship between the Quote Product Entity and the Order Product Entity. This is a useful technique when working with any custom fields in a Opportunity-Quote-Order process in MSCRM. This help was Brilliant! It worked perfectly for what I needed to do. Thank You! I now want to do exactly the same but I want to pull in 6 custom fields from the product Entity in to the opportunityproduct Entity. but the result returned nothing in both instances. Please advise where I have gone wrong. Alternatively, are you able to send me the GUIDs of these two relationships between the (1) product and the quotedetail and (2) product and opportunityproduct. I am in desperate need of an answer. Unfortunately MSCRM does not give us the option to edit the mappings between Product and the ‘line type’ entities for Opportunity Product, Quote Product, Order Product and Invoice Product – and so we cannot bring down fields from the Product screen by the normal Customisation methods. 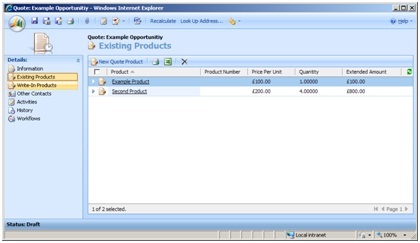 Once populated, we can use the mappings technique outlined in this post to preserve the values from the initial point of entry to the Quote Product then to Order Product and to Invoice Product depending on the business process. Best bet is to look at the earlier post for ‘2. 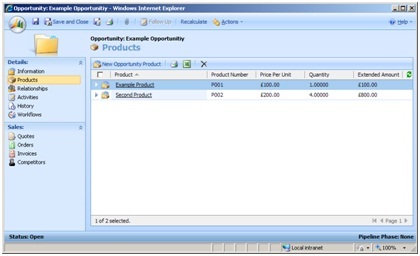 Adding Opportunity Products’ – this gives an example of how to pull down the default Unit of Measure and Product Number field into the Opportunity Product screen upon the user selecting a particular Product for the Opportunity. I got help from Daniel Cai’s CRM Web Toolkit. It worked great! Could be worth a link then! Is a good method of limiting the quantity of client-side script we need to use to put these resolutions in place, particularly as large amounts of client script can get difficult to manage and debug if not carefully controlled! Thank you for this post. This helped me a lot as we have created new fields in CRM for Leads, Accounts, Contacts and Opportunities. I edited the default mappings that came with the system and added the mappings for my custom attributes. Now when a Lead is qualified, the proper values are passed over to Contact, Account and Opportunity records. Would it be possible to map the Order Products to a new custom entity e.g. Entity Products? This is exactly what I need for what I am trying to do. However when I use the Id returned by the query into the URL as instructed i get an error saying the entitymap with that Id does not exist. Any ideas will be greatly appreciated. Thanks. Doh.. amended the link, thanks for pointing that out. Thank you very much , you make my day ! I have tested the quote detail to sales order detail mapping. and it works. Thank a lot. I would be really appreciated if you answer my question. The company i am working for normally does not use “unrecommended” practices. So what i want to know is whether this is a recommended practice. Thanks a million, that’s very usefull! This tool is great and easy to list and modify EXISTING mapping (visible and hidden). 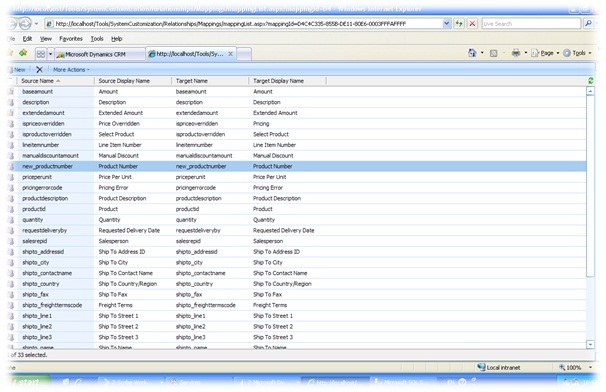 BUT how to initiate a mapping betwen Salesorderdetail and a new entity detail ? I had to create a new entity which is mapped to salesorder entity. This is working fine. The problem is that I don’t know how to create the mapping of the détails of these 2 entities, in that case Products. Any idea about how to initiate this mapping at detail level ?